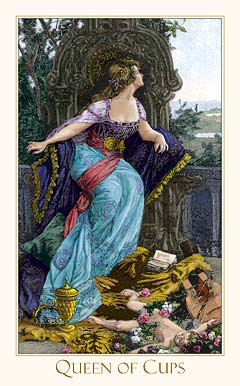 Weekend Reading: Queen of Cups from the Victorian Romantic. Remember back when you used to wistfully anticipate a call from a new love? Daydream about a reunion with your soul mate? Or delightedly wallow in the thought of your partner showing up unexpectedly in the middle of the day, simply because they couldn't keep away from you? Anticipation is sweet. And if it has been a while since you've experienced it, you can remedy that this weekend. Somewhere in your world there is someone or something to look forward to. It may not be as dramatic as a white knight rushing in, scooping you up and whisking you away, but that doesn't mean you can't give it the same treatment. Just for the seratonin of it. So lose yourself in sweet, sweet anticipation this weekend. Even if you're just anticipating pizza delivery. Revel in the melty cheesy goodness of life and turn some part of your life into something more magical.